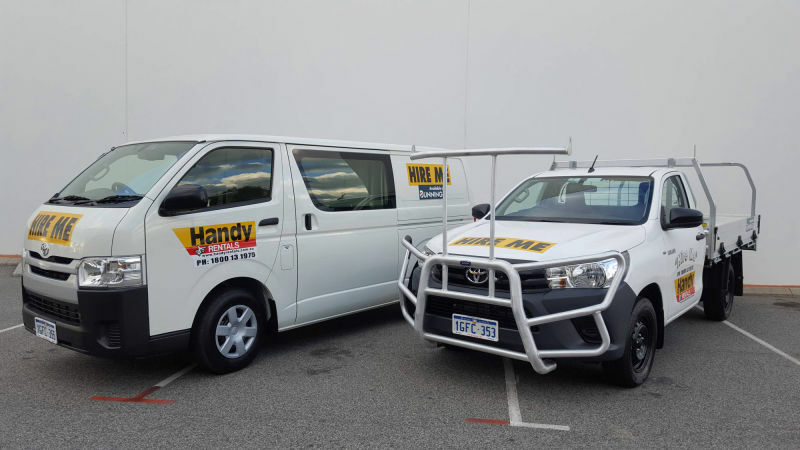 A fast new way to book UTES and VANS from Handy Rentals. 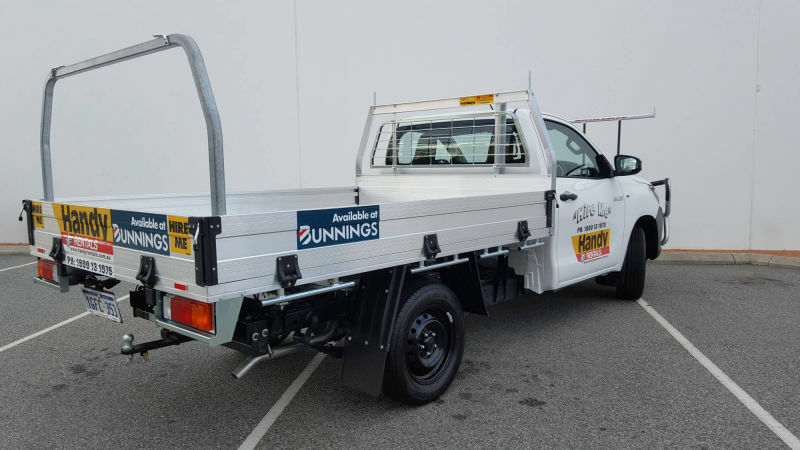 Our vehicles are conveniently located at your local Bunnings Warehouse, with over 200 locations throughout Australia. Let us find one for you. 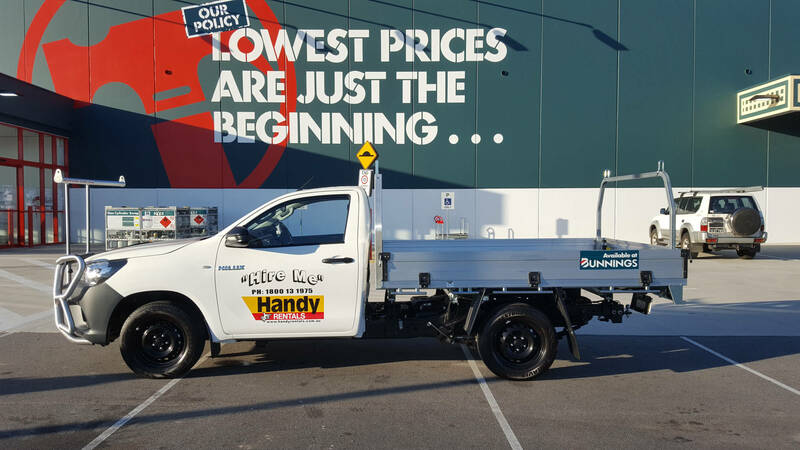 Tell us when you would like to hire, choose your nearest store - and we'll find you the perfect Handy Rentals UTE or VAN. 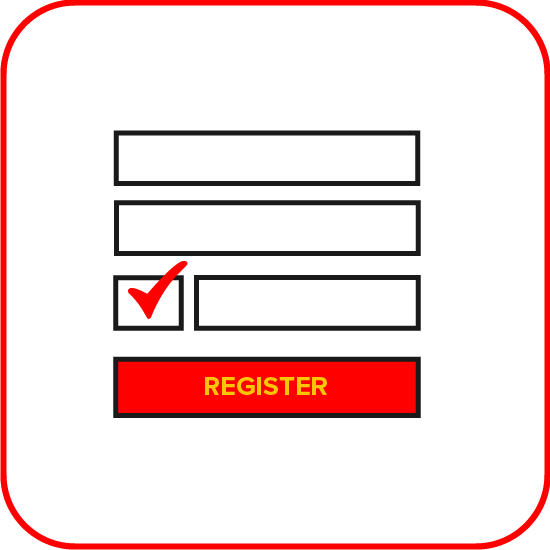 Use our powerful Booking Wizard to find your nearest store and check availability for the dates you want to hire before you join for free. To complete your HandyHire online booking, please have your driving licence, payment card and mobile phone ready. It should only take a few minutes. Present your Booking ID and your registered driving licence and credit card to any Bunnings Store Team Member to Pick Up and Drive. No forms, no waiting, no fuss! Just quick, easy and convenient vehicle rental. Loading and unloading is a breeze with drop side trays. The tray size is 2.5m long x 1.8m wide, large enough to carry full sheet materials, FLAT. They also have power steering and air conditioned cabs to make it a comfortable drive for you. Our 1 tonne vans are a perfect solution for those who need the security a van offers. All our vans are less than 5 years old, have automatic transmission and run on Unleaded Petrol. They come standard with a side access door, air conditioning and power steering. 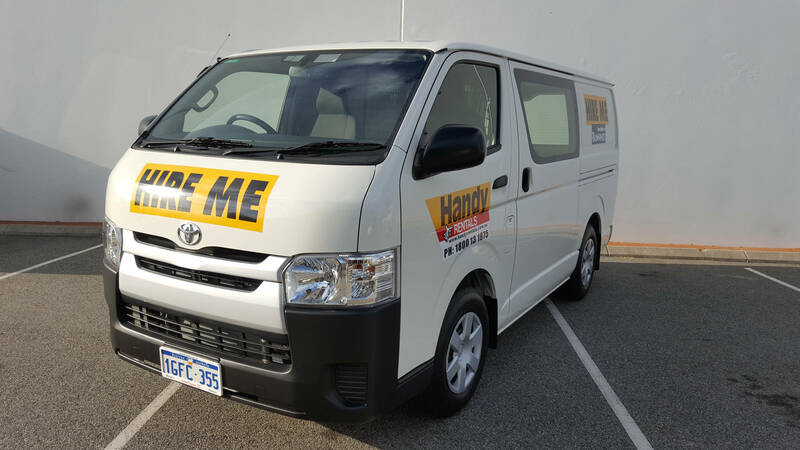 Our fleet consists of Toyota Hiace’s which have an approximate cargo area of 4.3 cubic litre capacity. Tolls – A day pass is available at the time of hire for $12.50 which will provide you with unlimited usage of toll roads throughout your hire. If the toll pass option is declined at the start of the rental but toll roads and/or bridges are used during the rental period, the hirer will be charged each toll fee plus an administrative fee of $30 per toll incurred. 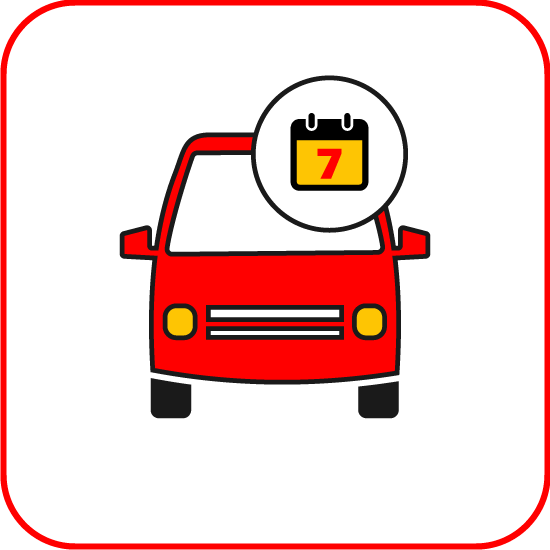 Drivers – all drivers must be 21yrs or over and hold a full manual/auto driver’s license. Sorry no ‘L’ or ‘P’ plate licence holders or ‘E’ plates due to insurance purposes. 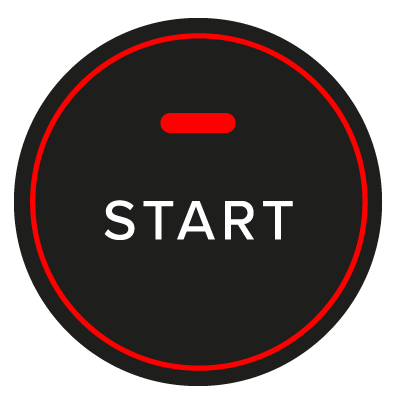 Deposit – all hires need to pay a deposit on a credit/debit card credit account only on commencement of hire. The credit card holder must be present to sign for the credit card on commencement of hire and will need to be present with the same credit card on completion of hire in order to refund the deposit. Standard Deposit 24hr hire or less: $200; longer term hires, interstate or overseas license: $500. 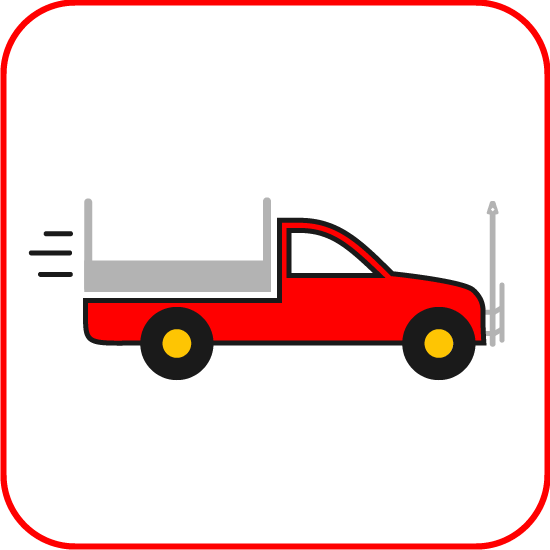 Fuel – all vehicles must be refuelled to the same level when taken. Eg. hired with full tank – return with full tank. Sighting of your fuel receipt will be requested to ensure vehicle has been refuelled with correct grade of fuel. If hirer does not refuel, additional charges will be incurred. Insurance – all hires include our Standard excess of $3500 this is included on all hires unless insurance waiver has been paid. Insurance excess waiver – the standard excess of $3500 may be reduced by paying a waiver fee of $35 per day; for drivers aged 21-25yrs this will reduce the excess to $1500, for drivers 25-75yrs this will reduce the excess to $750, for drivers over 75yrs this will reduce the excess to $1750. The insurance excess waiver charge includes the tyre and windscreen cover for the hire period. Single vehicle incident or impoundment liability – This is an additional $1000 excess that is not waiverable and relates to where another driver or vehicle can not be identified. Permissible weight loading’s are exceeded or overhead and/or underbody damage incurred. This excess is also applicable if the vehicle is impounded. Payment of insurance excess – applies in the event of any damage to our vehicle and/or any accident/incident our vehicle may have been involved in whilst on hire, regardless of fault. Tyre & windscreen waiver – the hirer is responsible for any tyre and/or windscreen damage that occurs whilst the vehicle is in the hirers possession and will be responsible for the payment to fix/replace any damaged tyres or windscreens. 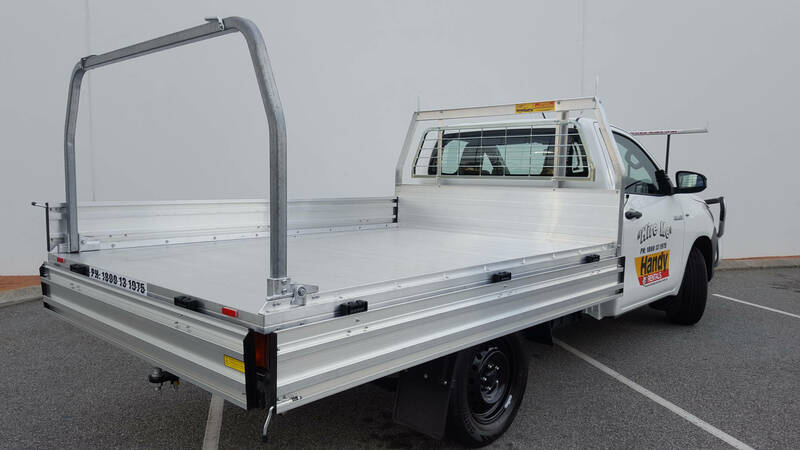 This liability is waived by the hirer by paying the insurance excess waiver (above) of $35 per day to reduce the insurance excess and cover the windscreens and tyres during the hire period. Vehicle condition – all vehicles must be returned in a clean and presentable condition. If the vehicle is returned dirty and/or there is cigarette or unpleasant odours in the cab, a cleaning fee will be charged. Keeping our fleet up to date with the latest models and providing the widest choice of locations and hire options at the most competitive rates possible is incredibly important to us. But it is our customer service that sets us apart. We are a family-run business based in Australia, serving Australia. From Day One, we have strived to provide the best possible customer service. 20 years on, we still treat every day and every customer as if they were our first. 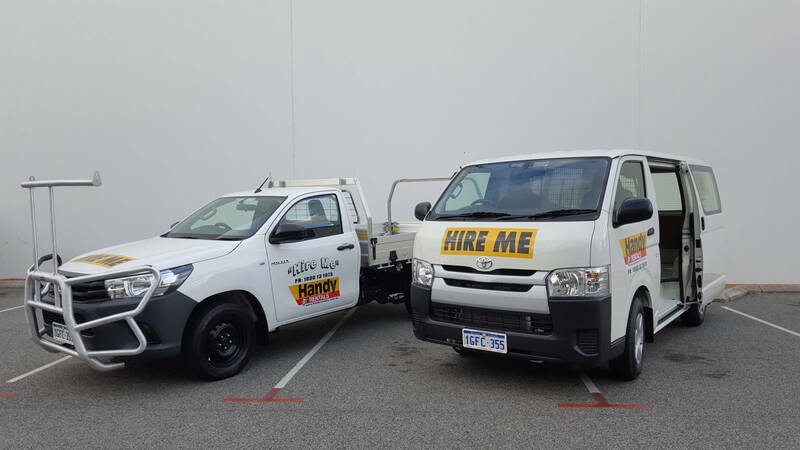 Should you need any support using this site or hiring any of our vehicles, please call +61 1800 131 975 and one of the team will be only too happy to help. The test of good customer service is how a company deals with things when they go wrong. Handy were exemplary when I had an accident. 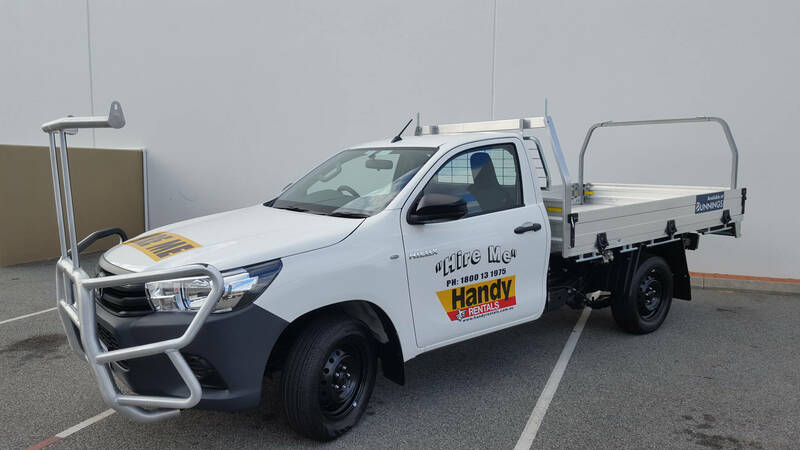 Hiring a vehicle through Handy Rentals was a great experience! Not only is the price very competitive but the process was very efficient. 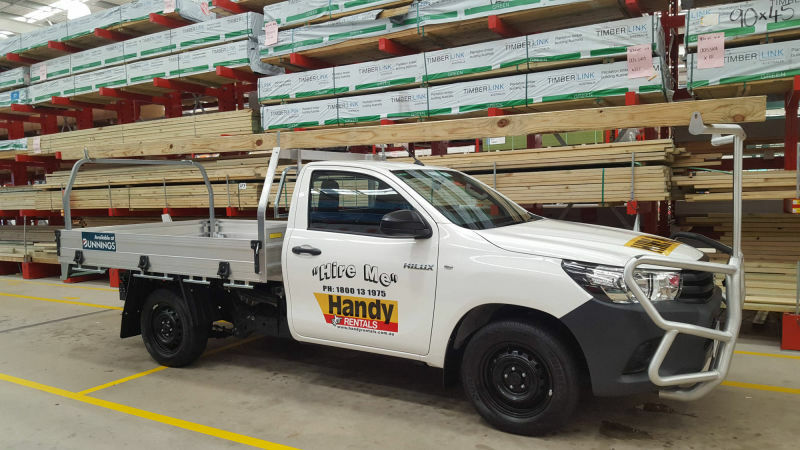 The convenience of being able to access a Handy Ute through my local Bunnings store is fantastic. Thank you. Very helpful and provided good information over the telephone. Paperwork easy to complete, the store staff advised of the best hire charges to keep costs down.The vehicle provided was near new and in clean condition.